Video games offer hours upon hours of recreation and fun for children and teens, as well as adults. As harmless as this may seem, spending too much time gaming can be a bad thing for some people. As far as unwinding from a hard day’s work, a couple hours may not problematic. Ultimately, the time spent gaming only becomes a problem when other life areas start to suffer. According to the U. S. National Library of Medicine, the difference between excess and addiction has to do with the degree of dysfunction compulsive gaming causes in a person’s life. In effect, video game addiction symptoms are pathological behaviors that hamper a person’s ability to live a healthy lifestyle. More than anything else, a person’s preoccupation with gaming most characterizes a video game addiction. This preoccupation takes over the addict’s thoughts and motivations to the point where he or she loses a grasp on more important aspects of daily life. This video game addiction symptom becomes most apparent within a person’s conversation as well as in how he or she organizes or schedules the day’s activities. 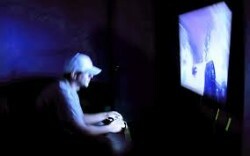 Video game addiction can cause mood swings. People addicted to video gaming experience emotional “highs” and “lows” comparable to what drug addicts go through. When experienced on a repeated basis, this behavior can alter the brain’s normal chemical processes. Over time, brain chemical imbalances start to take shape. When this happens, noticeable fluctuations in mood become apparent. Not surprisingly, all of these symptoms go away once a person can resume game play. It’s not uncommon for someone exhibiting video game addiction symptoms to also be struggling with mental health issues. For some people, a depression and/or anxiety disorder can predispose them to gaming addictions. For others, mental health problems develop out of a video game addiction disorder. In either case, the intensity of video game addiction symptoms can escalate quickly as addiction and mental health disorders tend to feed off one another. This means, the severity of a person’s addiction will increase at a considerably faster rate than someone who doesn’t struggle with mental health problems. As with all addictions, the longer a person engages in video gaming behaviors the more priority it holds in his or her life. This shift in priority alters the degree of importance a person places on essential tasks, such as personal hygiene and grooming. Consequently, the addict will spend less and less time attending to his or her self-care habits. Much like the substance abuser requires larger and larger drug doses to experience the desired “high” effect, gamers will spend more and more time playing video games. This need to spend more time at play reaches a point where a person loses the ability to limit play time. It also makes him or her unable to stop the behavior altogether. As video gaming takes on more importance, time spent engaging in other interests and activities gradually dwindles down to nothing. In effect, the brain chemical changes brought on by hours and hours of video gaming has warped the brain’s reward system, leaving a person psychologically dependent on the “rush” that video gaming brings. By the time video game addiction symptoms start to surface, any time spent away from gaming leaves the addict disoriented and unable to function effectively, according to Shippensburg University. At the early stages, a noticeable increase in mistakes on the job tarts to occur. Later on, the addict opts place his or her job at risk as missed days at work start to happen more often. As the amount of time spent gaming increases, time normally spent with friends and loved ones decreases accordingly. In extreme cases, this change in behavior drives a person to isolation where the majority of his or her time is spent playing video games. This video game addiction symptom may indicative of an underlying psychological disorder, such as depression. Once video game addiction symptoms take over a person’s life, people with relationship and/or family obligations will likely enter into ongoing conflicts with those closest to him or her. Once addiction takes hold, neglecting relationship and family obligations becomes the norm more so than the exception. Time missed from work coupled with money spent purchasing video games and/or buying memberships at online gaming sites will inevitably eat away at one’s finances. Before long, the addict starts to spend money designated for bills on gaming accessories while disregarding overdue rent and utility payments. Since addiction takes root in the mind more so than the body, a video game addiction can easily trigger alcohol and drug abuse behaviors. In the same vein, video game addiction symptoms can grow out of an already existing alcohol or drug abuse problem. As far as video game addiction symptoms go, denial most distinguishes a video gaming habit from a full-blown addiction. In the face of any number of negative consequences, the addict cannot acknowledge video gaming as the source of his or her problems. Over time, video game addiction symptoms bring about an ongoing decline in a person’s quality of living. Job loss, broken relationships and declining health are part and parcel of the downward spiral that is addiction.